Why not celebrate the end of summer with a free Jamba Juice smoothie! Now through the end of September, it's September BOGO at Jamba Juice stores! What do you get? You get a free smoothie when you buy one! My kids love Jamba Juice smoothies and we will be making a special trip in there this weekend to take advantage of this great BOGO offer! Added bonus: I have a $10 Jamba Juice gift card that I can use, making our special treat totally free! 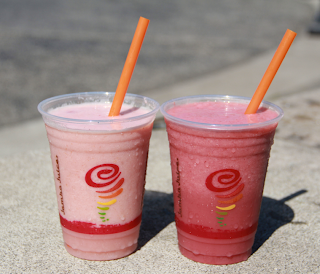 Don't keep this great deal to yourself, tell everyone that it’s buy one get one free smoothies at Jamba Juice! Valid 9/20/2013 – 9/29/2013 at participating Jamba Juice stores with BOGO free coupon.